In just about any fishing scenario that doesn't require a large boat with a fancy insurance policy, a pedal drive kayak is going to open up a ton of new possibilities. You can trawl a couple lines while casting, hold your position in current, maneuver easily in tight spots, and pick your nose without taking your line out of the water. This technology is decades old and, instead of other pilot drives that spin a propeller, the Hobie Mirage Drive waves like two undulating penguin wings through the water to push you forward. It sounds weird, it looks weird, but it works. The Hobie Mirage Outback is considered a great self-propelled fishing vessel for a reason: it's incredibly stable, versatile, and provides the fewest barriers between you and fish in waters all over the world. This year, we've seen fishers in Hobie Outbacks land a massive wahoo off Guam, an epic sailfish near Panama City, and many others. The Outback can definitely handle anything from calm lakes to choppy ocean. Considering price, performance, and versatility, we give the Hobie Outback a B+. The Hobie Outback has been a fairly consistent kayak for the last few years in terms of features, but that doesn't mean the company hasn't made a few key changes recently. This technology was first introduced twenty years ago and, for years, it rode off its reputation as the niftiest new thing in kayak fishing technology without getting an update. With the advent of other pedal drive kayaks involving propellers, this technology came to be criticized for its inability to go in reverse. This year, Hobie changed that. The new drive features shift cables. Yank on one, and the fins will rotate 180 degrees and push you in reverse when you pedal. Haul in the other, and you'll go back to forward drive. True, this is slightly more difficult than other pedal drives in which you merely need to pedal backwards, but it's still a great feature. So long as you're not navigating a kayak obstacle course, you should be fine. One of the most popular features of Hobie kayaks has long been the captain's chair. Constructed almost entirely of durable mesh, it keeps things breezy on hot days. It can be adjusted in all kinds of different ways and, for people who worry that foot-peddling around all day is going to aggravate his or her lumbar region, don't worry. You'll be able to adjust this to a comfortable position. It also sits nice and high above the water, making it easier to land fish. Hobie made another update with the kayak's storage. The center access to the hull now closes with a corkscrew hatch seal. It's also attached so you won't forget it on the shore when you're gearing up for a day of fishing. Some special editions come with a square hatch compartment with a locking flap as well (and others custom order this feature from the company). Both types of compartments are regarded as very water tight, but perhaps not 100% water proof. The bow has another compartment that closes with bungies. This is good for popping in non-go-to items such as lunch, a bacci set, or cold beer. Behind the captain's chair, there's a large hold extending most of the way toward the stern. You know what to put here. Many reviewers added in a crate sold by Hobie in this area, others used a milk crate, others used nothing at all. It's fairly large and bungies cover it so nothing large will pop out. There are also a ton of smaller compartments around the kayak like rod holders, elastic-mesh-encased pockets on the side, cup holders, and gunnel troughs where you can stick random stuff. Because this kayak moves with a pedal drive, their needs to be a different steering mechanism than the typical pedals connecting to a rudder. On the Hobie Outback—like other Hobies and many other pedal drive kayaks—the rudder connects to a swiveling lever that sits down at your left hip. By all accounts, this works well and, once you get used to it, doesn't make fishing awkward in any way. One popular customization to the rudder is upgrading to a fatter sailing rudder. This allows you to turn on a dime; many love it for its versatility. We'll expand on the subject of sailing below. You should have no problem rigging up any extra gear on this kayak. The built-in transducer mount comes standard as does through-hull cables, making it easy to hook up fish finders. You'll find a few screwed in plugs along the gunnel area as well where you can mount other gear. Regarding the competition, the Hobie Outback stands out as a great all-around, seaworthy vessel equipped with one of the best pedal drive systems found in kayaks today. It stretches just over 12" in length and 33" in width, making it slightly above average when it comes to stability and total storage space. The kayak alone weighs 81 lbs., but fully rigged, it can go well over 100 lbs. You pretty much need to get a cart for this guy. The hull is 15" high and, with the adjustable captain's chair, you can raise it even higher above the surface. The kayak is rated for a maximum of 400 lbs. If you hook something bigger than that, you're going to need a bigger boat. When it comes to the Mirage Drive pedal system, the pedaling is generally pretty easy and more efficient than using a kayak paddle. Compared to other pilot drives, it tends to be a little slower. If you like to peddle long distances to get to your favorite holes, think about bringing a paddle along. We generally recommend bringing a paddle along anyways in case something goes wrong with the pedal drive. The Outback has clips that easily hold a paddle out of the way on one side of the hull. As Ty from 30 Miles Out demonstrates, the Hobie Outback is one of the best kayaks around if you plan to do some frequent sailing. We've already spoken about the advantages of the sailing rudder, but beyond that, the Outback is especially equipped to hoist a sail and even hold a tack. The secret lies in Mirage Drive. You can lock the two fins into a vertical position and essentially turn them into a center board. With other kayaks, you either need a pretty direct tailwind or some custom work to be able to harness the power of the wind. As with many other features, Hobie also provides a sail kit that integrates very easily and effectively with the Outback, especially regarding the sail, which attaches firmly to a central mount in the hull. As Ty also demonstrates, the kayak is very stable and truly allows for you to fish standing up. 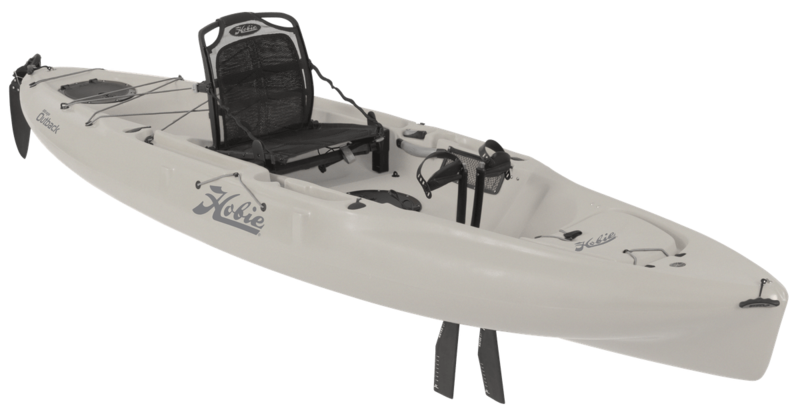 In terms of the other fishing kayaks that Hobie offers, the Hobie Outback is one of the more popular, mid-range vessels. The Quest, for example, looks much like the Outback but has no pedal drive and costs significantly less. The company also offers several other pedal kayaks like the Revolution and the Compass along with a series of inflatable Mirage Drive kayaks. The Hobie Pro Angler series, meanwhile, sit above and beyond the Outback; they're considered by many one of the best fishing kayaks currently available, not to mention one of the most expensive. In comparison with other brands, the Hobie Outback stands up favorably with the Native Watercraft Slayer Propel. Depending on where you shop, the kayaks should cost roughly the same give or take a hundred bucks. The main difference between the two is that the Slayer features a propeller drive. You'll be able to go backward without yanking on a shifter cable, but you also won't be able to configure a sail and tack at all against the wind as with the Outback. The Slayer also has tracks. Wilderness Systems has also put out a comparable vessel with their Radar series. The hull storage on this kayak is less ideal and the company is relatively new to pedal drive technology. We're not sure their construction is up to Hobie standards. On the other hand, they have two sets of tracks. At this point, Hobie is pretty much the top dog when it comes to pedal drive kayaks. They've been making these boats for over 20 years and they've established themselves as a reliable brand. The price is going to reflect that. If you're avid about harnessing the power of the wind while kayaking, we absolutely recommend the Hobie Outback or a similar Hobie model (we didn't even talk about the outriggers you can attach). If sailing isn't your thing, the Outback presents a great all around pedal kayak, but it's worth looking around to make sure you find exactly what features and price you're looking for.